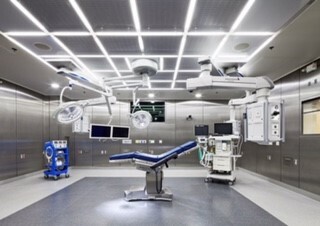 The CLEANSUITE system is an all-inclusive, modular ceiling diffuser system that may be built-in and hung directly above the patient table in an operating room (OR) and other locations requiring low turbulence, laminar airflow. CLEANSUITE systems remove airborne particles and contaminants away from the area of the patient on the operating table, bathing the patient in HEPA-filtered air, while at the same time preventing entrainment of room air surrounding OR personnel and equipment. CLEANSUITE systems evolved from manufacturing environments for cleanrooms where particulate levels are strictly controlled by Federal and industry standards. As a result, CLEANSUITE systems can help you create a cleaner environment that exceeds ASHRAE standard 170 requirements using proven technology and design practices from thousands of operating Huntair cleanroom applications worldwide.